Use a lot find no problems always 1st class. Located less than ten minutes from both terminals, Good To Go Park & Ride T2 & 3 offers a cost-effective, time-efficient and convenient solution for all travellers. Simply drive to the car park, grab your bags and jump on one of the regular shuttles to the terminals. Buses operate 24 hours a day and run approximately every 10-12 minutes. The journey takes around 7-15 minutes. 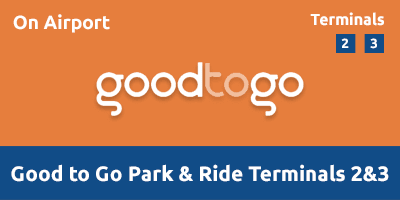 Good To Go Park & Ride (T2 & 3) is protected by security fencing and manned 24 hours a days with frequent patrols. The car park is a holder of the police-approved Park Mark Safer Parking Award. Bays for Blue Badge holders are located adjacent to Bus Stop 6 near the exit. Wheelchair access is available on courtesy coaches. If you are using a sat-nav, please enter the postcode TW6 2SB. Leave the M4 at J4 or M25 J15, then follow signs for Heathrow Long Stay T2 & T3. Exit on the East Ramp (opposite the Emirates airplane), and take the third exit at the Nene Road roundabout. Turn left at the traffic lights onto Northern Perimeter Road West and follow signs for Heathrow Long Stay Car Park. At the fourth set of traffic lights, turn left at the Enfield Road roundabout..
After a short distance, Heathrow Long Stay T2 & T3 is on the left. Do not push the button for a ticket unless one has not been automatically issued. Return to the car park using the following transfers: Shuttles from Terminal 2 pick-up from Bus Stop 6 outside arrivals, while transfers from Terminal 3 collect from Bus Stop 16.